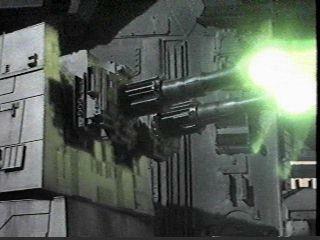 Turbolaser cannons are considered the primary weapons aboard Imperial warships and space stations. They are very powerful and reliable. A variety of TL cannons exists in SW. They are not all simply a long barrel on a turret, as is generally thought. In the image above, a turret-mounted TL is preparing to fire. The turret can swivel in either direction, and the barrels themselves can elevate or depress, to give the weapon a wide field of fire. The rotating component is situated on a tower to increase the visual field from the guns, therefore increasing the firing arc. 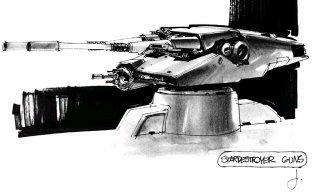 The rotating portion of the turret is approximately the same size as a starfighter, and the barrels are on the order of ten meters long. These cannons are likely responsible for the middle-sized TL bolts, which are the most common seen in the films. 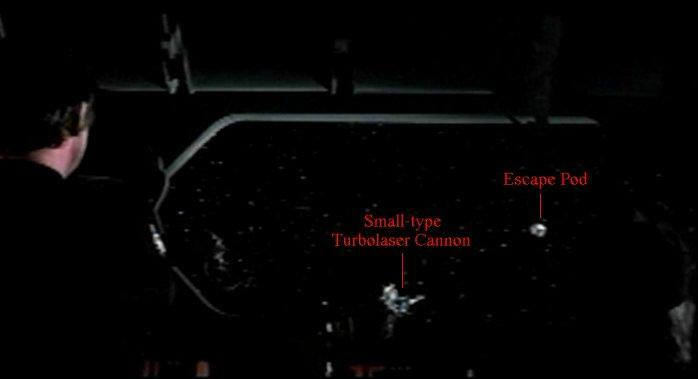 X-Wing blaster cannons have a device near the end of the barrel which is commonly called the "flashback surpressor." 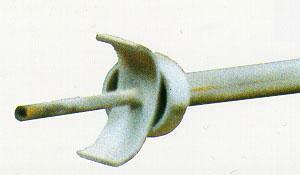 The purpose for this device is generally agreed to be the prevention of damage to the barrel itself from "flashback" of the bolt. It is interesting to note that the device is not in the form of a dish, as would be expected. Instead, it is a thin parabolic strip. However, this strip is vertical, so it would not protect the pilot from "flashback". Since the device is not a dish, it may have some type of magnetic qualities which allow deflection of any stray portion of the beam. It may otherwise be part of the targeting system. 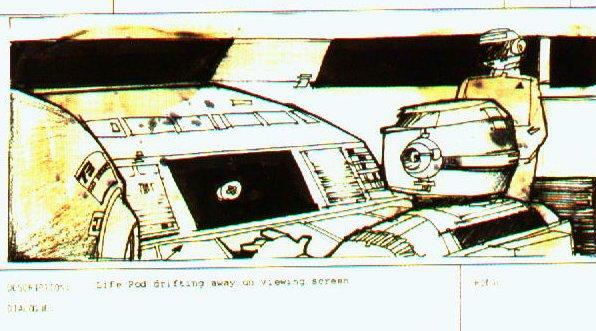 As Han's blaster bolt deflected off the walls of the garbage compactor in ANH, a magnetic field from this strip may perform precise adjustments to the path of the bolt. In this case, the strip could only direct the bolt "up" or "down" in relation to the orientation of the fighter. It could not direct the bolt to starboard or port. This would not present a problem since X-Wings generally rotate around their saggital axis to turn. The device may otherwise be part of the targeting sensor system. This type of device is not generally seen on other fighters. Of course, X-Wing cannons are longer than most fighter weapons we have seen; perhaps this presents some reason for the device? It does seem that all starfighter blaster weapons have barrels that extend forward at least to the point of reaching the cockpit. Perhaps this is to protect the pilot in some way? Maybe this is the reason for the long barrels on X-Wings. 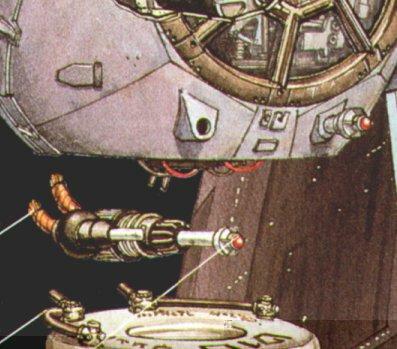 The exception to this is the cannons situated on top of a Y-Wing's cockpit, but most offical sources describe these as ion cannons, not blaster cannons. ISDs have parabolic structures just ahead of the landing bays, which are generally labeled as tractor beams. However, it appears that a TL cannon is present in the device. 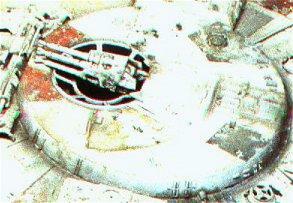 The cannon appears to be surrounded by a dish, as opposed to the X-Wing's strip. The bolt appears to be firing at an angle of almost 90 degrees from the barrel's orientation. This supports the theory that the "flashback suppressor" is actually part of the targeting system, since the bolt took a dramatic turn when exiting a presumably straight barrel. In this case, the cannon would have the potential to fire at any target in the visual field of the dish. In other words, the firing arc of the cannon would be an almost perfect hemisphere around the ventral surface of the ship! This would be a valuable advantage for large vessels such as Star Destroyers that have low maneuverability when compared with starfighters. In the image at the top of this page, the TL barrel enlarges close to the end, then decreases again. Perhaps the enlargement is a similar device for directing the bolts? TIE fighters apparently have this feature as well. Their blasters can track a target many degrees off the course of the vessel, while there is no apparent swivel or pivot anywhere around the barrels. They do have an enlargement on the end, with thin strips around the outside. 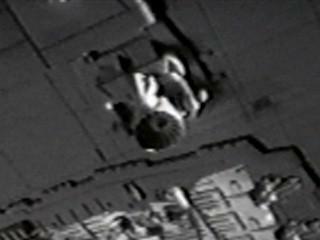 Interestingly, in the following clip, the blaster bolts are directed away from the vertical two strips. Do they guide the bolts, or is this a coincidence? 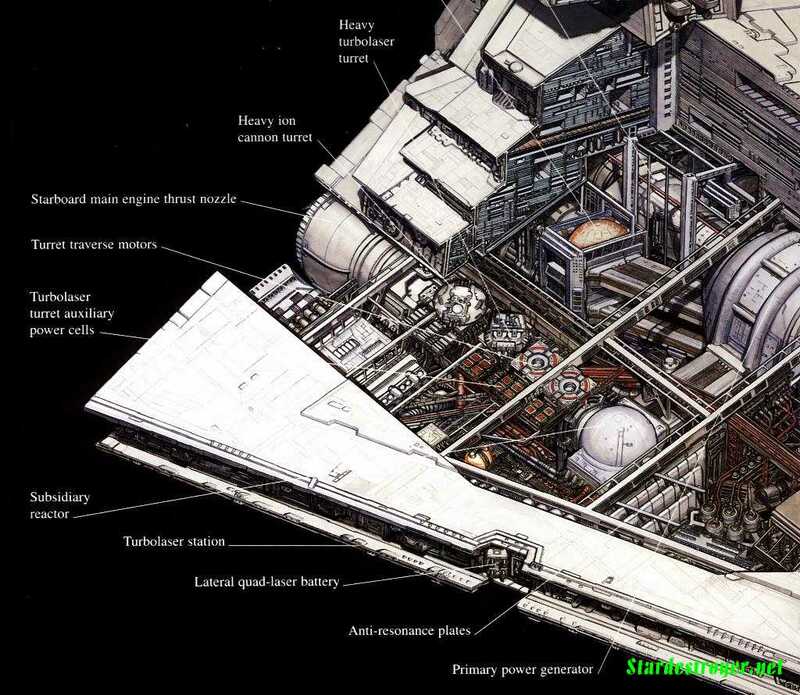 In this image, the Millennium Falcon's cannons have an enlargement close to the end as well. At first glance, this appears to be similar to the forked cannons present on Imperial walkers, but differences appear upon close inspection. Perhaps the device described above is housed inside the barrel? This would provide lower firing arcs, but would protect the device from micro-meteorites, etc. It does appear that the twin bolts are traveling at slightly different angles from their respective barrels. It may otherwise serve the purpose of focusing the beam just before it exits the barrel. But this does not explain the varying firing angles once the bolts have exited the barrels. The EGW&T states that this device splits the bolt into 2 smaller bolts. In this image, it is clear that this is simply not the case. Also, there are no clear advantages in splitting a blaster bolt into weaker bolts, as this would probably be less effective against shields. 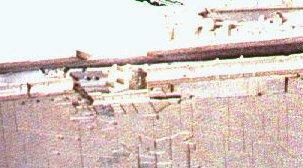 However, images of the quad-gun do suggest that there are two openings at the end of the barrel. But the fact remains that only one bolt is seen leaving each barrel when the gun is fired. Perhaps the two openings alternately release the bolt, to control overheating? 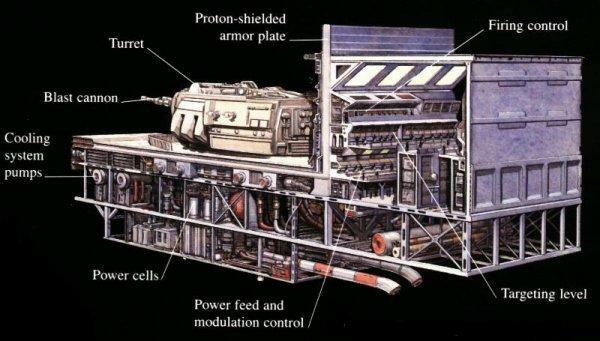 Another possibility is that the two openings fire simultaneously, and the resulting small bolts combine to form one bolt, similar to the firing method of the Death Star's superlaser. There has been some question as to whether the entire turret that houses these guns rotates or not. This is suggested by some Falcon models. But it appears that pipes and wires from the body of the ship connects to this turret, and would be broken if it were to rotate. 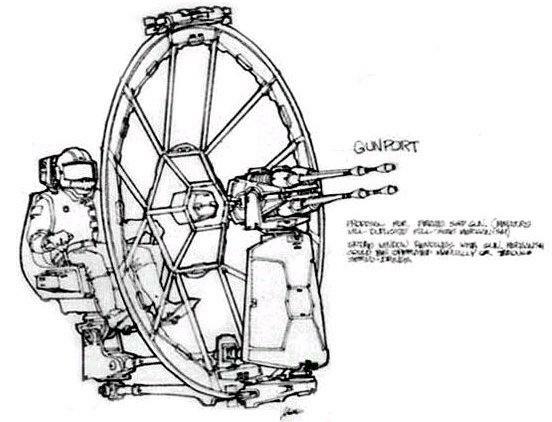 In a concept drawing, it becomes apparent that the guns can track such a wide field of fire because they rotate at two different points. The gun itself is connected to the round turret by a thin piece of armor. It becomes apparent that the gun pivots one direction on this piece of armor, and the armor pivots against the hull of the ship in another direction. This allows the gun to swivel side-to-side and up-and-down relative to the gunner's point of view. This effectively allows the guns to fire on any target in their field of view, forming hemispheres around the top and bottom of the ship. The radius of this hemisphere would be the range of the guns. Virtually any ship in firing range of the Falcon should be within at least one of these firing arcs. It is also interesting to note that this piece of armor, along with the gun itself, partially protects the gunner from enemy fire. Also, in this drawing, each barrel only has one opening. However, in the actual model and set used for the film,, this armor plate has been replaced with a metal bar. The gun pivots up and down on the fork in the end of the bar, and the bar itself rotates side-to-side. This image courtesy of Robert Brown, author of the Millennium Falcon page. In this image, the two rotation points are labeled. The point where the "bar" rotates is labeled "A". The gun rotates in the "fork" in the end of the bar at point "B". This mechanism works similar to a modern automobile's drive-shaft. The universal joint on the end of a drive-shaft has 4 pivoting points, which allows the joint to pivot in almost any direction. As the gun is turned, the gunner's seat turns as well, increasing the gunner's field of view. It is also interesting to note that some cannons show "recoil" after the bolt exits the barrel. 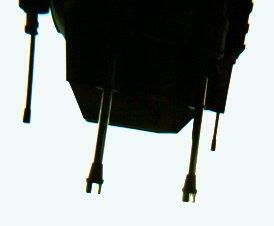 In the picture above, the Falcon's top barrels are recoiling as the lower cannons fire. The argument has been made that the barrels retract while the others are firing to protect them from damage resulting from "flashback". However, this is somewhat questionable since double TL turrets usually fire and recoil simultaneously. Turbolasers are more powerful, and surely more dangerous to operate than the small weapons aboard the Falcon. It seems that the description of "flashback" may be in error. In any event, the cause/purpose of this recoil is a mystery. ISDs seem to have three sizes of TLs present. Curtis Saxton states that the largest of these have barrels of approximately 14 meters in length. 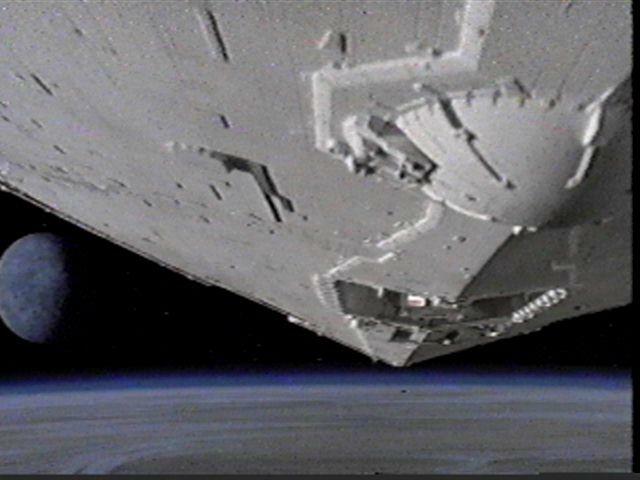 On the ISD-II subclass, they are situated on 8-barrel turrets, which are approximately 50 meters wide (Imagine a turret over half the size of an American football field containing 8 barrels, each one as long as a house). This makes them much larger than the DS defense TLs as witnessed in the images above. They are located on turrets on each side of the command tower. There are 64 of these large cannons present. It is safe to assume that these cannons are more powerful than the middle and small sized TL cannons distributed over the surface of the ship. It is probable that these cannons are responsible for the "long" TL bolts. Little else is known about these cannons, as they were never seen in use in the films. 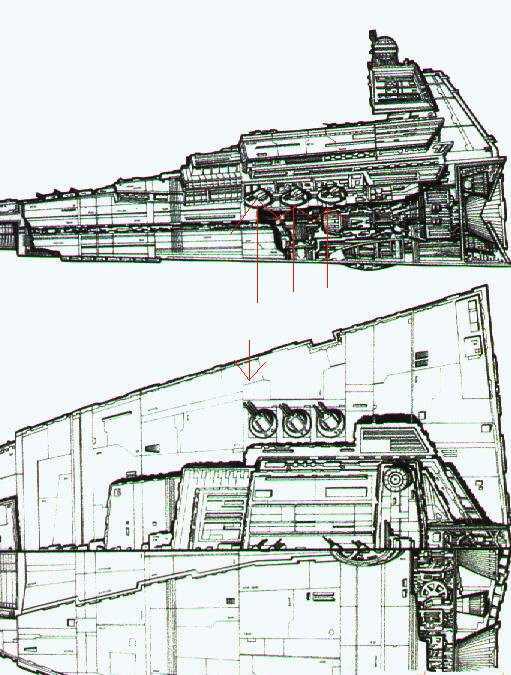 ISD-Is appear to have similar turrets, but with only 2 barrels, each of which is much larger than those mentioned above. The rear turrets on both sides mount ion cannons, while the other turrets hold turbolasers. 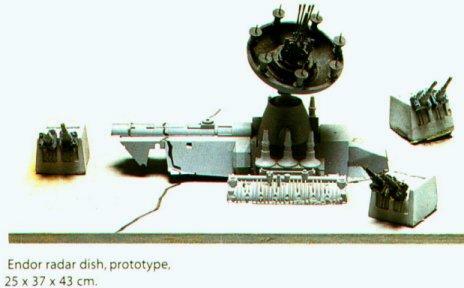 This model also has a 4-barreled large cannon in the aft trench notches on each side of the vessel. This image represents some of the DS defense cannons. It is not known whether these cannons are small turbolasers or heavy blasters. Each battery consists of an artillery-sized cannon on a swivel mount, a "window" or opening into space, and apparently 3-4 operators. The opening into space does not allow for a very wide field of fire. This is not consistent with the wide firing arcs seen on ISDs. Perhaps the sherical nature of the DS, and virtually unlimited power, permits a high concentration of these weapons, with each one having a small field of fire? Perhaps each cannon is only responsible for a small field of sky, allowing the gunner to more effectively defend this small area? 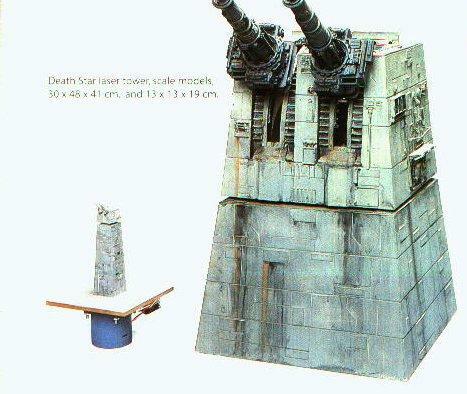 These cannons, whether small turbolasers or heavy blasters, are larger than heavy blaster artillery used on the ground. 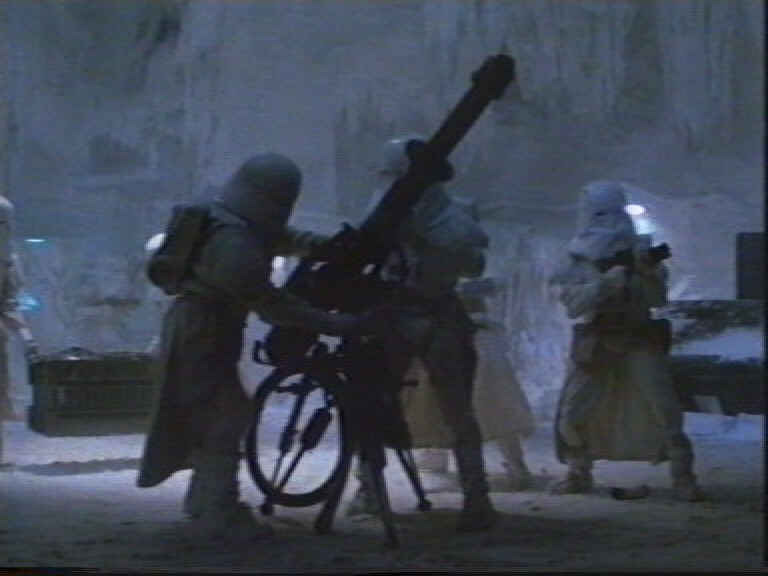 This includes the cannons used by the Rebels to defend Echo Base, and the cannon Snowtroopers attempted to use against the Millennium Falcon (called an "E-Web" by TEGW&T). In the early moments of A New Hope, an apparently similar cannon is preparing to fire on an escape pod, from the ventral surface of an ISD. An officer states that it has no life signs, and orders his underling to let it go. The pod was targeted and scanned in seconds. This indicates that each battery is self-sufficient, with it's own sensor package, gunners, and commanders. 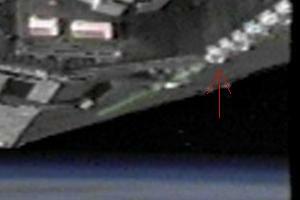 This is a marked advantage for a vessel such as an ISD, which has over 200 weapons emplacements. Operating this many isolated weapons from remote control on the bridge would be very inefficient. It appears that the window, or otherwise viewscreen, is much larger than its counterpart on the DS. This most likely contributes to the excellent firing arcs of ISDs. These cannons are probably responsible for the small TL bolts which are generally seen firing at fighters and other small vessels. This is supported by the high firing rate seen from these weapons on the DS. 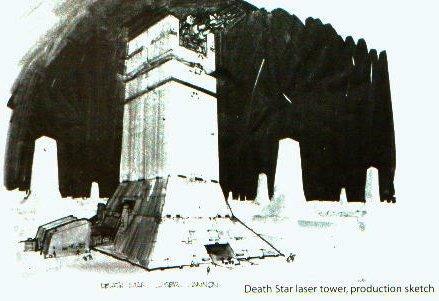 If so, this is the size of weapon that sent the Millennium Falcon reeling off course with a single hit in TESB. These weapons are probably the most common on Star Destroyer side trenches, as heavy turrets are too large not to be seen. 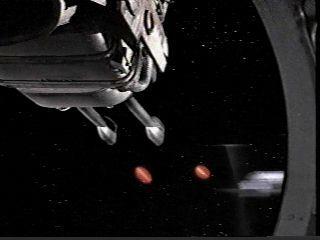 The TPM trailer Quicktime gives a good view of turbolaser cannons of a generation earlier. 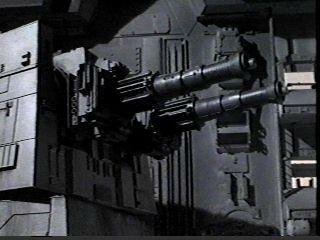 These cannons are similar in some ways to the Millennium Falcon's quad-blaster cannons. The 4 barrels fire simultaneously, at least in the current setting. They pivot "up/down", and I suspect that the white ball-like structure connected to the hull allows rotation side-side. These cannons present a sharp contrast to the classic trilogy's armored turrets. These cannons are much more open to enemy fire. It appears that these turrets are either automatic, or internally controlled. It seems that the Trade Federation employs automated technologies almost exclusively, as is evidenced in their battle droids. 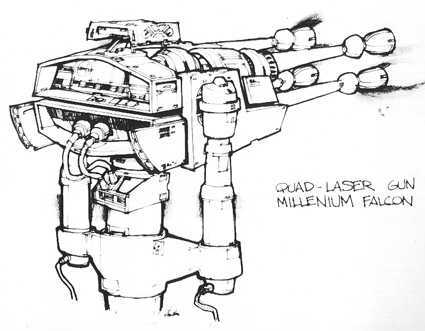 From Star Wars to Indiana Jones: The Best of the Lucasfilm Archives has images of turbolaser turrets that give some cues to the actual scaling, especially since these are images of the actual models. Stills from the Behind the Magic CD-ROM have some scaling cues as well. 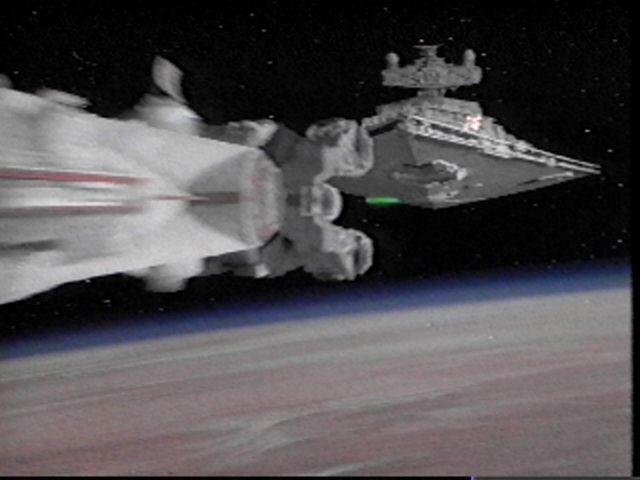 This image has X-Wing fighters in the foreground and the background, which allows possible upper and lower limits to be established on the size of the turret. The EGW&T has some possible (official but non-canon) scaling cues as well. Personal blasters vary in style and size, but in the films, there are only a handful of common types. The EGW&T implies that Han Solo's blaster (referred to as a BlasTech DL-44) is relatively uncommon, but Luke Skywalker carried one as well. 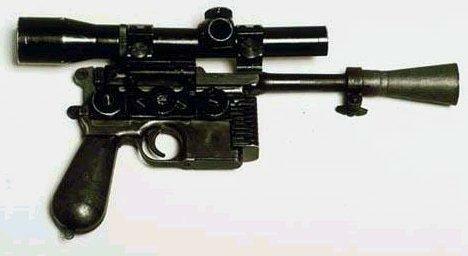 In fact, it is the most common type of blaster pistol seen in the trilogy. The standard weapon carried by stormtroopers is a blaster carbine. It has a folding stock which can be extended to assist with long-range firing. The stock can be folded down to allow close quarters combat, and so that it can be fired with one hand. These blasters are apparently very powerful and reliable. They easily penetrate stormtrooper armor, and never misfired or overheated once throughout the trilogy. Their design is fairly simple, as even Ewoks learned to use them in the midst of battle. In combat, many times simple weapons are more effective than complicated ones. Fancy computer displays and eleborate aiming devices may assist with long-range targeting for snipers. But in combat, a computer's ability to process information is unimportant. The human brain's ability to process and react is important. The more devices a soldier has to think about, the less he can concentrate on the battle. 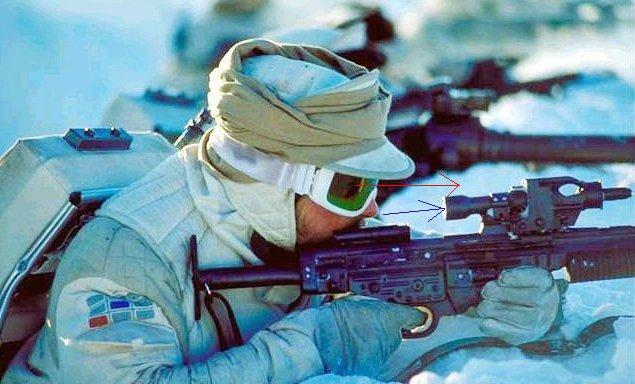 For this reason, a stormtrooper blaster carbine has a simple scope on the top, that has a wide eyepiece and lines up quickly with a human's eye when the weapon is raised to the shoulder. This allows quick firing. 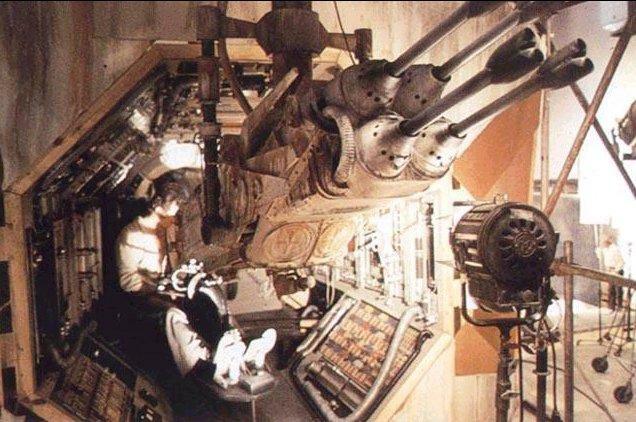 Controls are quickly operated as well- a stormtrooper converted his carbine to stun mode in 1 second or less in ANH. The EGW&T states that this weapon is designated as the BlasTech E-11, and has a maximum range of 300 meters. This range limitation seems strange. A modern hunting rifle (such as my 30-06) easily has an effective range of 300 meters, even for an average marksman (such as myself). The standard firearm of a galactic empire's elite soldier should be more powerful and have greater range than that of a primitive slug-thrower. 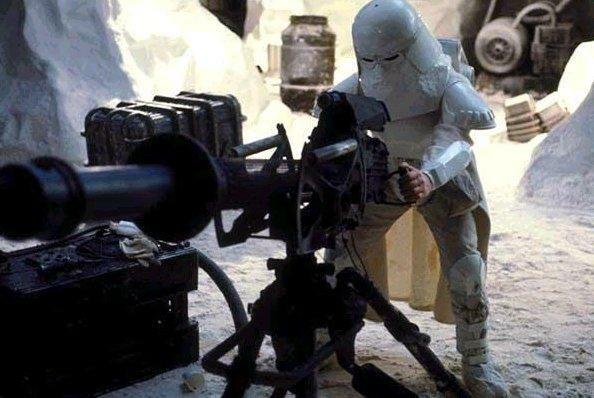 This is especially obvious since a stormtrooper would not have to compensate for the trajectory of a projectile, when firing his blaster (A bullet from my 30-06 may drop several inches below the level of the barrel by the time it reaches 300 meters, forcing me to aim above my target). From observing the movements of the actors in the films, it appears that this weapon is slightly front-heavy. This means that it is not perfectly balanced. This is not a disadvantage, as it can sometimes make the weapon more steady when raised to the shoulder. One disadvantage in this design does exist, however. When raised to the shoulder, the soldier cannot grip under the barrel, as it is covered by a heat dissipation plate. This could cause serious burns to the operator. Because of this, the marksman must grip close to the middle of the weapon with the foreward arm, possibly causing difficulties with aiming. Otherwise, this rifle has good ergonomics. A rifle's stock should provide enough angle downwards to compensate for the height difference in the marksman's shoulder and eye. Some Rebel blaster rifles don't provide sufficient angle, causing the marksman to crane his neck and squint his eyes to aim. 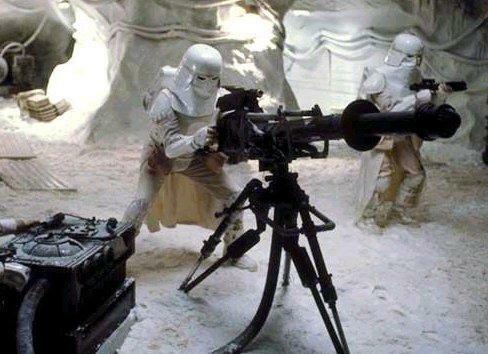 Rebel soldiers are most often seen using different types of blasters. But when they steal stormtrooper blasters, they usually use them. This is seen many times, when the main characters are seen carrying these weapons. This implies that stormtrooper blasters are in some way better than the ones used by the Rebels. One type used by Rebel soldiers in TESB was also seen with the Bounty Hunter droid IG-88 in TESB. Since this type of droid is stated to be old in official references, this type of blaster is probably old too. This makes sense, because the Rebels would rarely have access to new weapons. 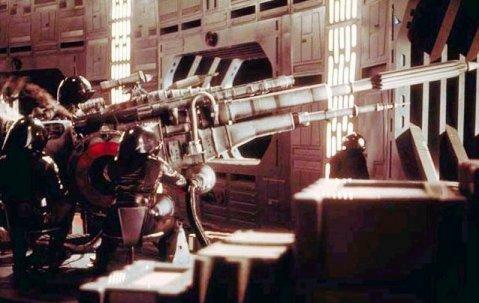 Yet another type of blaster was carried by soldiers on the Tantive IV in ANH. This type of blaster is probably relatively new, because it was carried on a "consular ship", or at least a vessel disguised as one. 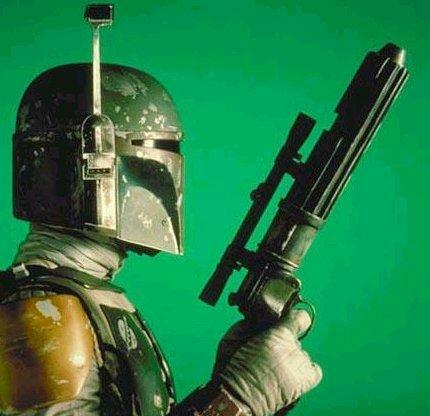 Bounty hunter Boba Fett carries yet another type of blaster. Bowcasters seem to have been improperly described by "official" (non-canon) references. The EGW&T states that bowcasters have a maximum range of 50 meters (page 18). 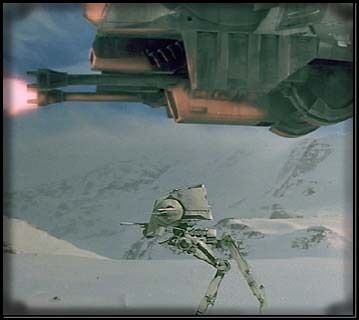 However, Chewbacca seriously damaged a speeder bike at a range of well over 50 meters, possibly farther than 100 meters (guesstimation from visual cues) in ROTJ. Later scenes show blaster pistol bolts striking speeder bikes, and doing no visual damage. This implies that not only does a bowcaster have much more firepower than a blaster pistol, but also that the bike was well within range. Of course, it is possible that the bowcaster hit a much more vital area than the blaster pistols did, but this would imply either enormous skill and accuracy (to hit a specific component on a moving target from more than 50 meters away with a snap-shot) or incredible luck. Also in this scene, Chewbacca fired twice in less than 1 second. The EGW&T states that his bowcaster has "an automatic recocking system". Otherwise, "it may take several seconds for the warrior to get off another shot". This theory is very imaginative, but a close visual inspection of the scene frame-by-frame (in the "pan&scan" version, as it provides a close-up of the bowcaster) reveals that the bowcaster's string did not move when the weapon was fired. The accompanying diagram further invalidates the weapon's description by labeling a "blaster gas chamber". Incidentally, no string is seen in the diagram. A simpler explanation is that the weapon is simply a blaster (as it plainly fires blaster bolts instead of "explosive quarrels"), with a simple crossbow on top in case the wookie user wishes to hunt game the old-fasioned-way. 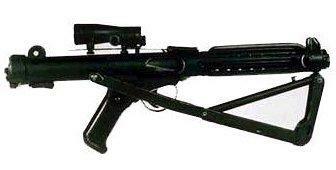 The crossbow could also provide defensive capabilities after the blaster ammunition runs out, much as a bayonet is a last-ditch weapon on an assault rifle. The two nodes could well produce an atmospheric "Casmir" effect if provided with sufficient power. The nature of the field(s) in question produced by the nodes is still a matter of discussion by my colleague Joao Leao and myself, but consider a visual analogue to be similar to what happens to a wristwatch when it gets dropped next to an active Magnetic Image Resonance machine. Basically a linear accelerator in disguise as a medical device. This would not focus the beam or bolt discharge in question, but it would likely be accelerated, perhaps to some great extent. The two nodes could actually be powerfully (positively) charged and the amount of the overlap of the two energy fields created by the polarization nodes could be controlled by the expansion/contraction of the thin non-conductive bar set between the nodes that we mistake for a "string". This could explain why we never see the "string" move, simply because it's actually quite solid and happens to fit the visual idea that we have for a crossbow. Question here: did the weapon name itself after it was made, or did its name factor into the shape of the weapon? Both the nodes are simply weights to counter balance the sharp rear-ended balance point on the Bowcaster caused by poor manufacture and design. The string is there as a visual sales gimmick to appear to those "tough and rugged" individuals who like a "man's weapon" of significant weight and power. The idea of using variable electromagnetic fields as non-physical lenses for high energy focus is not a new one, and considerable work is currently being invested in it as I write this. Some of the current work in ZPF could well lead to propulsion systems quie similar in function to the ideas put to ink by science fiction writers of today. I tend to favor theory 2 here. It could be argued that by real time manipulation of the fields produced by the nodes (implying some sophisticated computer control over the weapon) that the beam/bolt of the weapon could be focused either for greater short range power, or for greater range with weaker power. Possibly, Chewie's weapon could have only the one setting, or his weapon's onboard electronics automatically tailor the focusing fields based on ranging target data from the weapons sensors. All this equipment built into the weapon would likely increase its weight to at least that of a present-day fully loaded M-16A1 or M-60. Hardly the weapon for a person needing a "fast" firearm for the smugglers life. A Wookies strength would allow him to carry this weapon without penalty. Also there is the possibility that prolonged exposure to the dual polarization fields could have an adverse affect on the human system. Again, Wookies may not suffer the same penalities as humans around the weapon and may actually be totally unaffected by fields considerably stronger. Well this is my spin on the Bowcaster at present. I hope that some of this information promotes further discussion on human technological advancement.